As a student in biology Wildlife of North America, I would like to tell a quick story of my first encounter with a wildlife animal. constant barking of our dog in the backyard. She did not bark often so the fact that she was going insane was a clear indicator that something was happening. My father and I went out to the backyard to see what the problem was and all we could see was the dog constantly barking and circling around one of palm trees in the corner of the backyard. And then it hit us like a brick wall. The very strong odor of a skunk. It was an intense smell. With no way to get near the animal to give it a way to escape, all we could do is call animal control. 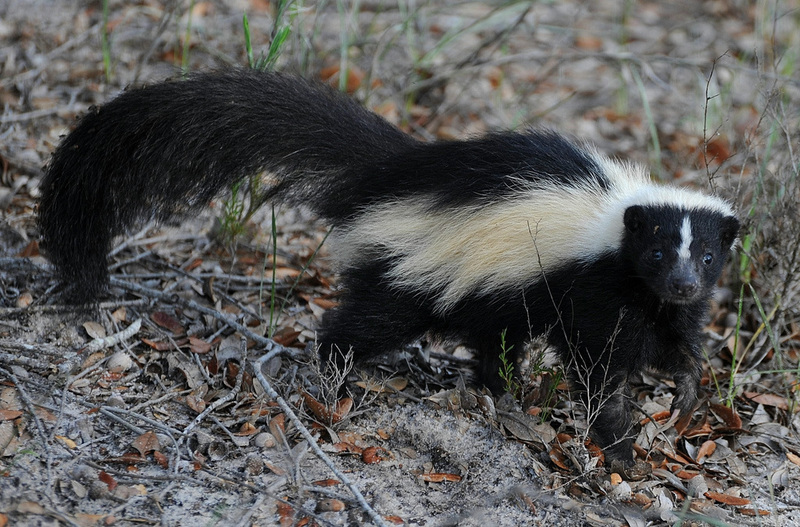 We were told that skunks will spray a predator in the eyes to blind them so they can escape. The skunk was unable to do so because the dog was using the dried up palm trees as a shield from the spray and keeping the skunk cornered. Kudos to the dog. Not sure I would have thought of that. The smell was so strong that my parents couldn't sleep in their room for about three days. Our tv room was pretty unbearable for a few days and we couldn't run the air conditioning because it would circulate the smell through the vents in the entire house. The dog probably smelled too. Not the most exciting story but that is the first encounter I can remember. Below is a photo of what I believe the savage beast looked like.